Was a little board so I decided to do some 1st amendment expression of my 2nd amendment views. Seen plenty of these for AR's and AK's, but none for my beloved Styer, so I decided to do my own. It is crude and crappy, but that is why I don't make a living as a graphic artist. Brief history lesson, When Mexico still ran Texas, they gave the settlers a cannon for protection from the natives. 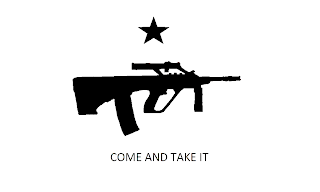 When the Mexican government decided to be tyrannical pricks and take away the cannon, the settlers said no, made a flag with a picture of a cannon with a star and the words "come and take it." The Mexican Government tried to take it, and not only failed but sparked the Texas Revolution. In recent years the constant threats by the feds to ban and take away our peace keepers has sparked the embers of patriotic expression, and for many, the AR, AK, Styer, 1911, etc, is their cannon. We need them to defend against the evils of the world just as much as those early Texas settlers did. And yes, the mag looks a bit long, because the original model I used to base the picture on had the 42 round mag in it. Only 42? Then you'll need more than one. Oh, I have several more magazines for it. Nice thing about the 42 round mags is they are not much more expensive than the 30's for that rifle. It looks good to me. So no yearning to learn art?